Here at ChiIL Mama we think sour is sweet! We adore Juicy Drop & Gummies & Dylan's Candy Bar, and we love it when our favorites play nice together. Come on out to be one of the first to try this pucker inducing treat and enter to WIN some seriously sweet (& sour) prizes here (open nationwide) through midnight 3/26 and at THIS Saturday's Chicago based event too! Disclosure: We're pleased to partner up with Juicy Drop and Bazooka. They have provided review samples and prize fulfillment for our giveaway. As always, all opinions are our own. Bazooka Candy Brand’s Juicy Drop is taking over Dylan’s Candy Bar in Chicago on Saturday, March 21st to challenge candy lovers’ taste buds with a first taste of new Juicy Drop Gummies. Fans will have the chance to take a turn on the Juicy Drop Prize Wheel to win fun giveaways including T-shirts, temporary tattoos, stickers, candy, and more. One lucky attendee will win a basket filled with candy and other fun prizes from Bazooka Candy Brands! Full details below. One of ChiIL Mama's lucky readers will also WIN a Juicy Drop Gummies sampler (Estimated value $15) including all four flavors! CLICK HERE to enter all week. Juicy Drop is hard-core candy dripping with attitude that puts you in control of the sour intensity so you can push your limits each and every time you dare to drop. New Juicy Drop Gummies combine delicious soft gummies featuring a special “drop zone” with the signature Juicy Drop sour gel pen allowing fans to combine the two for an amazing taste experience. The new Juicy Drop Gummies will challenge taste buds with an exciting line-up of deliciously sour flavors including Knock-Out Punch, Blue Rebel, Apple Attack and Watermelon Blast. Juicy Drop Gummies first arrived in stores in January 2015 with a suggested retail price of $1.60 to $2.20. The Juicy Drop brand has always been a leading force in category innovation as evident from their most recent launch, Juicy Drop Gummies. Juicy Drop, the #2 selling non-chocolate candy front of store¹, features a unique two-in-one candy experience that enables consumers to control their flavor intensity. First launched in 2003, Juicy Drop Pop quickly became a mainstay in the Bazooka Candy Brands portfolio. Juicy Drop Taffy was added in 2012, bringing the innovative taste experience into the soft and chewy segment and is the one of the first taffy candy lines that lets kids customize the intensity of their chosen flavor. 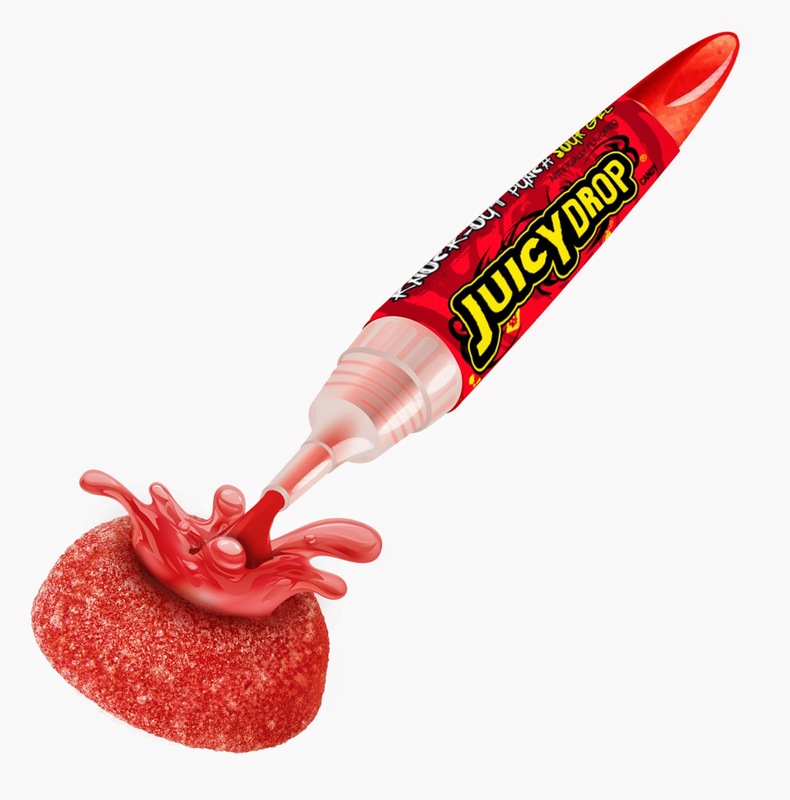 Juicy Drop Taffy spearheaded the Juicy Drop’s brand’s growth which drive the Kids Non-Chocolate category across all channels by 64² percent in a two-year period. The Juicy Drop brand is part of Bazooka Candy Brands popular confectionery portfolio that includes Ring Pop®, Push Pop®, Baby Bottle Pop®, and Bazooka® Bubble Gum. For more information, visit www.candymania.com. Bazooka Candy Brands, a division of The Topps Company, Inc., is about to turn up the intensity in the gummy category. The incredibly popular Juicy Drop® brand is expanding to now include Juicy Drop™ Gummies, a truly breakthrough confectionary innovation that lets fans control their flavor experience. 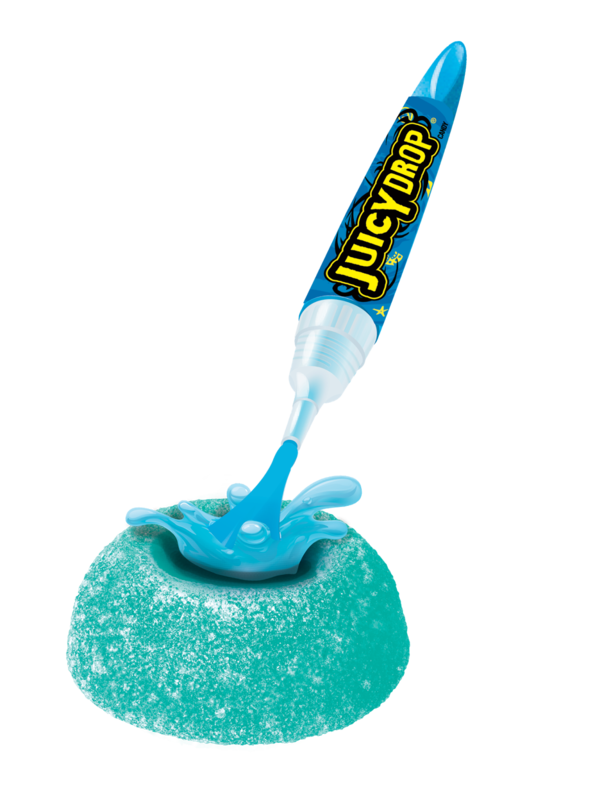 The product combines delicious sour-sanded gummies with the signature Juicy Drop sour gel pen. Using a special “drop zone” on the gummy, consumers combine the two for an amazing taste experience. Juicy Drop is a powerhouse brand that continues to be a top-seller in the category – ranking #2 in front of store non-chocolate sales.The brand has also been a leading force in category innovation. Back in 2012, when Bazooka Candy Brands expanded the brand into the perennially strong taffy category, Juicy Drop™ Taffy became an instant success. The product has driven the taffy segment by contributing more than 32³ percent to segment growth since its launch and currently ranks #11 among all non-chocolate candies³ in the front of the store. Now, Bazooka Candy Brands is bringing this same successful formula to the growing gummy segment. Disclosure: Once again, we're pleased to partner up with Juicy Drop and Bazooka. They have provided review samples and prize fulfillment for our giveaway. As always, all opinions are our own.